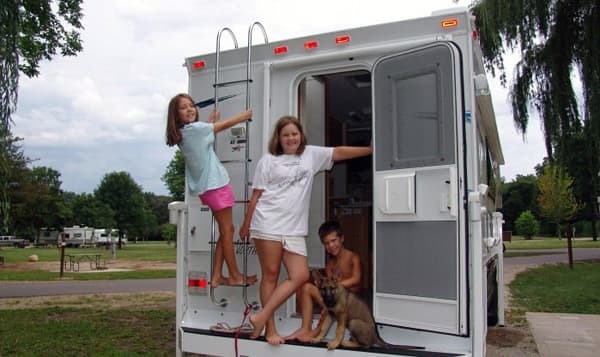 Together in their 2007 Northstar 8.5 Arrow, Andy and Guinness Spedden seek adventure from Nova Scotia to New York City to the thrills of Dollywood. 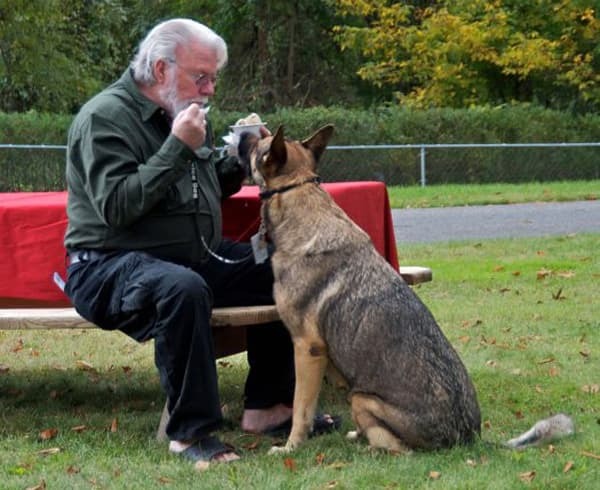 We first met Andy and his “puppy dog” Guinness at the 2008 Mid-Atlantic Truck Camper Rally. As a large German Shepherd, Guinness immediately commands your attention. Andy has quite the presence himself, although his bark is somewhat less menacing. It turns out both Guinness and Andy are quite the gentlemen. Andy loves talking about his Northstar and the many adventures he and Guinness have been on together. Perhaps not since “Turner and Hooch” has there been a more adventurous dog and owner duo. TCM: How did you find out about truck campers? Andy: In the 80’s, I was an RV mechanic in Florida. We did a lot of work on Jayco truck campers. We also had Class As and pop-ups. We worked on everything that came in the shop. I have an analytical mind and I’m handy. I inherited a 1972 Apollo Class A when my brother died. It was on a Dodge 440 Chassis. I had it for a couple of years. I was probably lucky if I got three miles to the gallon. At that point, it was twenty-two years old and things started going wrong. The water heater went out. The furnace didn’t always work. When things really went south, I was in Thurmont, Maryland staying at a campground. With the rent I owed the owner, I told him I’d give him my motorhome. That’s when I decided that I was going to a truck camper. 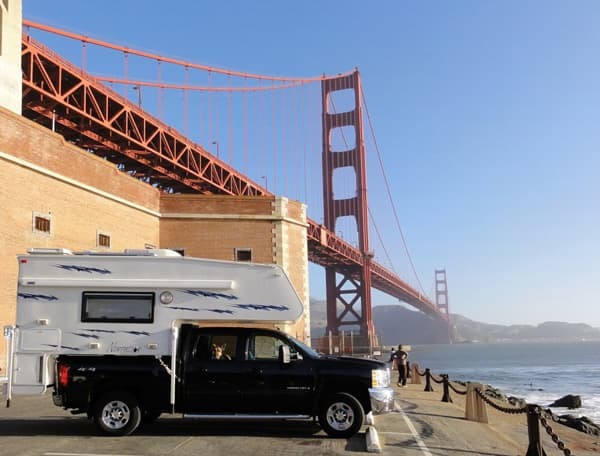 The greatest thing about a truck camper is that you can go anywhere with it. I started looking in Delaware and I saw a Northstar at a dealer here. I really liked the Northstar and the way it was built. I already knew how nice truck campers were because I had worked on them as a mechanic. One day I called Northstar and talked to Rex Willett, President of Northstar Campers. TCM: How did you end up with Rex’s camper? Andy: I started this idea of getting a dog, getting a truck camper, quitting work, and seeing the country. I ended up finding a dog breeder in Illinois on the internet. While I was there, I went see my nephew, Martin, in Chicago and then visited the Northstar factory in Iowa. On the way out west, I checked on my new dog, Guinness. The next day I went to Iowa and Rex welcomed me. They are great people! He let me talk to the guys and take photos. Because I was an RV mechanic, they let me climb on the roofs and look at the designs. I fell in love with the Northstar campers even more. Rex and I sat down and built a camper. I told him to let me sleep on it a night. The next morning there was a camper sitting there. He had used it for a show and used himself one time. It had more than I wanted, but he made me a deal I couldn’t refuse. I left Rex and gave him a deposit for the camper. I told him I would pick up the camper in a month. I drove back to Chicago and did some sightseeing with my nephew, picked up my new German Shepherd puppy, and then flew back home out of O’Hare airport. Shortly after, I took the truck out to Iowa and they loaded up the camper. Since the camper was specifically made for Rex, they let me pick it up in Iowa. They don’t normally have people pick up their campers at the factory. I packed up my grandchildren and my puppy and drove from Delaware to Cedar Falls. We arrived in the evening and went into a motel. The next morning we took my truck to Northstar. It was 104 degrees in Iowa! That day we went to the lake and played while Northstar got the truck ready. As soon as they put the camper on the truck in Iowa, I asked if they could measure my rig height. The railroad bridge near my house is 10’8” and my truck camper is 10’10”. Now I have bought a new truck and I’m even higher at 11’2”. That’s something that everyone needs to know. I put a sticker on my front windshield just to remind me of my height. That evening we went back and picked up the truck camper and went to a local campground to see how everything worked. The next morning we went by the factory, asked a couple of questions, they answered them, and we were off to Chicago. My grandchildren, Guinness, and I also went to Ohio to see my niece and we went through Shanksville, Pennsylvania to see where the plane went down.